How Group Singing Can Change Your Brain and Your Life! How Group Singing Activities Can Change Your Brain and Your Life! Crossword puzzles. Language classes. Games that sharpen the minds of anyone worried about declining mental activity. But these mind-saving remedies cost money and can be isolating—which is why you might want to consider breaking into song instead. Silly suggestion? Not according to author Stacy Horn, whose research into the relationship between singing and the brain (“Imperfect Harmony: Finding Happiness Singing With Others“) shows how group singing has been scientifically proven to lower stress, relieve anxiety, and elevate endorphins. Her research so impressed “Time” magazine editors, they profiled her work. Horn isn’t the only curious mind at work on the topic of the relationship between music and brain building. Many scientists agree it’s a perfect way to relax, unwind and grab some joy. It’s instinctual. You open your mouth, belt out a few bars of a favorite tune, and vibrations resulting from this physical action resonate so profoundly, singing can literally alter emotions. Join a chorus of like-minded souls and some impressive physiological changes take place in the body. 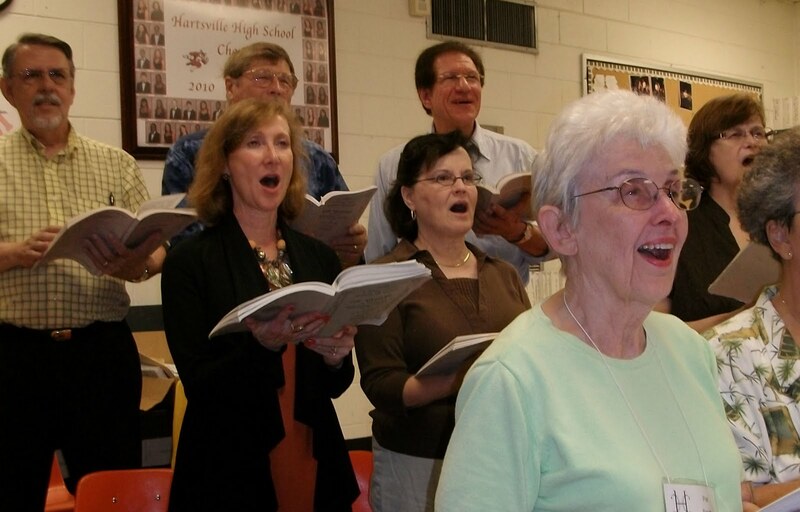 There’s no denying that it feels really good to sing with others, but recent awareness of the benefits of harmonizing has triggered an increase in the formation of singing groups. According to a Chorus America study, there are around 32.5 million adults participating in varying types of singing activities. That already-impressive number has increased by 10 million vocalists over the past few years. At first blush, you may assume that church choruses are primary recruitment venues, but that’s not necessarily so. Nor must one take a single lesson to qualify for auditions at the neighborhood and community singing groups springing up across the nation. 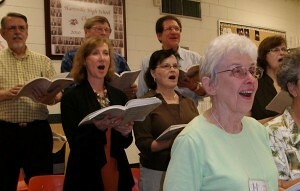 Chorus America estimates 270,000 non-church choruses currently operational across the U.S. They run the gamut from amateur clubs, regularly-scheduled song fests, little theater, gospel and spontaneous recreational groups devoted to belting out everything from David Bowie’s “The Man Who Sold the World”. Lesson learned? Few community hobbies are growing as fast nor offering so many physical and emotional benefits! Singing in a chorus sets off primal reactions in the brain, soothing nerves, elevating spirits and prompting feelings of tranquility. Even your heart rate may synch up when you join others in song and there’s plenty of evidence to back that up. What’s responsible for all of this bliss? First, endorphins, chemicals delivering the “natural high” enjoyed by runners hitting their strides, but when you sing with others, you can still enjoy the high without breaking a sweat. Here’s another lesson in physiology: You don’t have to sing the entire Carmina Burana libretto to experience a powerful surge of oxytocin, another chemical known to alleviate stress and anxiety. As oxytocin and endorphins are released throughout your body, a sociological element is added to the experience: feelings of trust and human connection, byproducts of this unique chemical release, flood the brain. Further, depression and loneliness in all age groups can be impacted and influenced by singing with other people. In other words, close proximity to others promotes to a general sense of well-being in all ages. The healing effects of social singing–lower cortisol levels, meditation-like heart rate lowering benefits and stress reduction–offer mental health benefits, too. For researchers striving to use fewer drugs and employ holistic healing practices, this is particularly good news. Did we mention that not a single music lesson is required to gain all of these benefits? If you’re convinced there’s a lesson to be learned from the “join a chorus” movement and want to know more about how harmonizing with others can improve your life, a final lesson is required to prepare you for your experience: You must accept the fact that there are no bad singers. Truly. It matters not that your grade school teacher found your interpretation of the “Star Spangled Banner” unworthy of an “America’s Got Talent” audition. Corral any insecurities you may have about your voice and find a simpatico singing home. Start your search with ChoirPlace and ChoralNet. If you’re not impressed, conduct a general Internet search in your geographic area using keywords like “Toronto choirs” and “Singing Groups in Toronto” to sleuth out local connections. You can also call community colleges, let them know you’ve no interest in lessons or enrollment, but a desire to affiliate with a community singing group. That may be all you need to change your life. Elite Music Academy offers singing lesson in Toronto. Contact us for a trial music lesson.